Here's a great tool, Nevado, for making the port of your JMS messaging layer to Amazon SQS (or even Comcast CMB) go easier. I'm corralling all the details here. 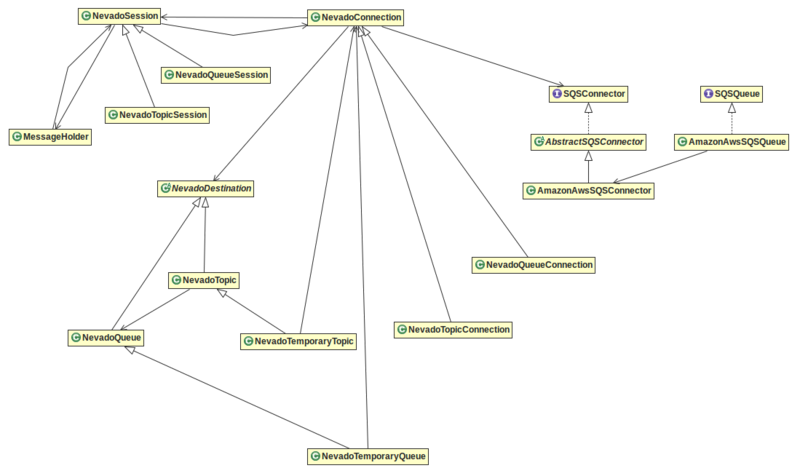 I used ObjectAid to generate some light UML; here's the legend. It builds cleanly via Maven from the command line and in an Eclipse project. There are a hundred or so warnings, mostly failure to use Java 1.5 generics (even though written quite long after), a great number of unused imports, variables and side effects. The class hierarchies are, for the most part, very simple. I illustrate them below using ObjectAid™ from Eclipse. This is almost all the classes. The only ones not shown are utility classes with few or no interrelationships. See the ObjectAid legend above and to the right for how to interpret the arcs. There's an excellent quick-start guide, but it's Spring-y. 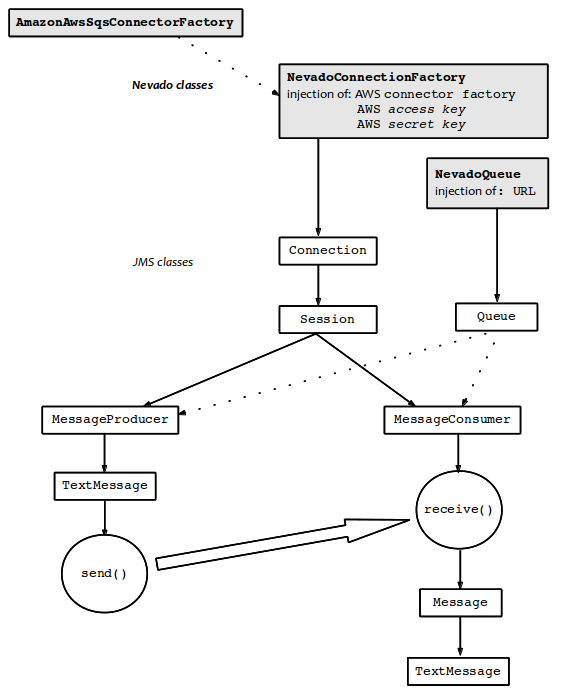 Here is a high-level diagram of Nevado's sessions, connections showing also Amazon SQS connectors. Nevado's Amazon SQS connectors, queues and messages. 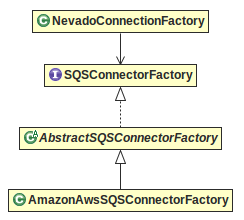 Nevado's Amazon SQS connector factories. 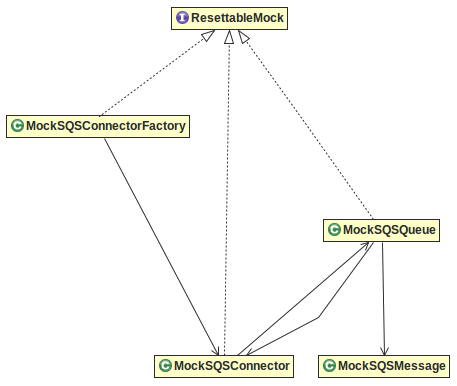 Last, for what it's worth, Nevado's mocking framework for testing purposes. Got the Sun JMS example running using Nevado atop AWS SQS. I created an Eclipse project. I needed a properties file to solve AWS configuration. These values here are dummies that look a little bit like what you'd see, but are of no actual value. Here's the sample code. Highlighting are those lines which are necessarily Nevado while the rest of what's going on is pure JMS. // Step 1: Create an Amazon AWS SQS connector factory for use in priming the pump. // this step is not part of the Sun example. // Step 2: Instantiate an Amazon or Nevado connection factory, injecting AWS credentials. // Step 3: Create a connection to Amazon SQS. // Step 4: Create a session from the connection. // Step 5: Instantiate a new JMS queue using a Nevado queue, injecting AWS queue URL. // Step 6: Create a message producer. // Step 7: Create and send a test message to the queue. // Step 8: Create a message consumer. // Step 9: Start the connection (created in step 3). // Step 10: Receive a message from the queue. // Step 11: Retrieve the contents of the message. // Step 12: Close the session and connection. Set up Amazon/Nevado connector to prime the pump. Set up Amazon/Nevado connection factory. This requires Nevado to inject the queue URL. Maybe this can be pre-injected in earlier steps? Make the producer create and send a text message. Launch the connection at this point. Probably just has to happen sometime before attempting to receive the message. Make the consumer receive the text message. Clean up by closing the session and connection. In case I haven't flogged this horse enough, here's a diagram of the above sample. The special, Nevado classes are marked in grey, but everything else is pure JMS.